If you find yourself asking that question a lot, here is a new Website for you. 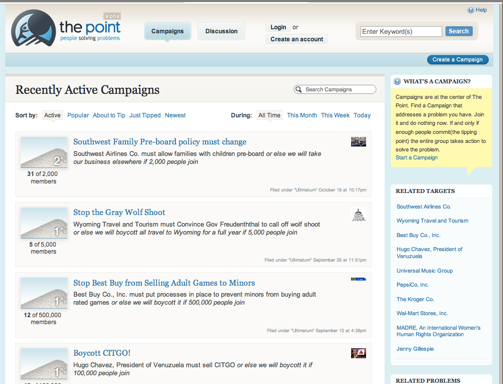 The Point is a social and consumer activism site that just launched yesterday. It brings a new twist to online grassroots campaigns. Anyone can create a campaign—to raise money for a political candidate or cause, to lobby a corporation to change its ways, or to organize neighbors to fix up a park. But here’s the twist: participants pledge to take action only when enough other people have pledged to do the same thing. That is, when support for the cause reaches a tipping point (hence the name). In this way, the site attempts to address one of the biggest obstacles to people signing up for a cause even if they believe in it—the fear that they will be wasting their time or money on something that will never result in change. On the Point, you only agree to take action if a cause can attract a critical mass of like-minded people. Some of the campaigns on the site include trying to get Aquafina to switch to bio-degradable bottles (50,000 participants needed), Universal Music to sell DRM-free songs (1,000,000 participants needed), or CNN.com to separate trivial human interest stories from actual news (1,000,000 participants needed—good luck). If the tipping point is reached, members agree to boycott a product, donate money to the cause, or take some form of civil action. This seems like a really smart way to tap into the culture of participation on the Web and channel it towards political, consumer, or local causes. The Point has raised $2.5 million from angel investors and will soon try to raise more in a VC round.